Farhiya can't read yet, but she's already a teacher. At only 4 years old, she calls over other children from the surrounding compounds of Kambioos refugee camp in Kenya and teaches them to wash their hands. It's a critical lesson. As the children watch, Farhiya turns the knob on the plastic yellow jerry can that serves as the family's hand-washing station. She confidently explains how to wash with soap and how to rub palms together to work up a rich lather. "If you don't wash your hands, you can get a stomachache," Farhiya instructs, as she continues to lather up. Sometimes Farhiya even sets up an impromptu classroom under the family's spiny acacia tree and uses a hygiene book, supplied by Catholic Relief Services to her father and other hygiene promoters, to quiz the neighbor children on cleanliness. 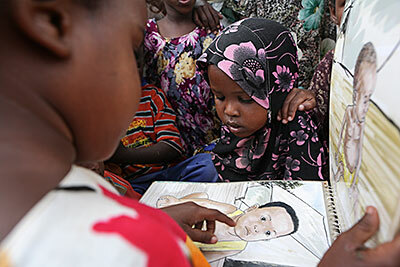 Using a large powdered milk container as a stool, Farhiya flips through the laminated book and shows about a dozen rapt children an illustration of dishes drying on the ground. "Is this right?" she asks them in Somali. "No," they respond, but when she follows up with "Why not?" and receives no answers, Farhiya whips her brown curls in the direction of her father and pouts, "They give the right answers, but they can't tell me why. They need to know why!" Her father, Ahmed Hussein, couldn't agree more. As one of the camp's hygiene promoters, he's intent on helping his fellow refugees understand the whys of hygiene and sanitation, and how cleanliness is critical to safeguarding the health of his family and community. Ahmed and his family arrived in Kenya at the peak of the Somali drought in 2011, when more than 1,500 Somalis were streaming across the border daily. The family sold most of their belongings to buy bus fare. They traveled with a sleeping mat, a cooking pot and the clothes on their back. Basic sanitation infrastructure—including latrines, hand-washing stations and waste management—are critical to managing such public health emergencies. With funding from Caritas Internationalis, CRS is providing more than 3,000 families in the Kambioos camp with basic bathroom and hand-washing facilities, garbage collection via donkey cart and a team of 80 trained hygiene promoters like Ahmed. "When I first arrived in Kambioos, diarrhea was a common thing," he says. "We thought anyone who lives in a refugee camp would get diarrhea. But when we learned that hygiene will improve the health of our families and our community, we realized that the myth is not true. People can live in a refugee camp and be healthy." Ahmed leads by example. His family keeps their modest compound pristine, not an easy feat under Dadaab's arid conditions, where even a mild breeze can cover the land with a fine layer of sand. Each morning, Ahmed's six children sweep and collect garbage while he disinfects the family latrine. Ahmed then makes the rounds of neighboring houses. He checks to see if enough water is available at the hand-washing station, if utensils are clean, if neighbors have prepared the garbage for collection and that a dirty container has not contaminated the drinking water. Rather than scold when things aren't up to standard, Ahmed simply begins to show how it's done. 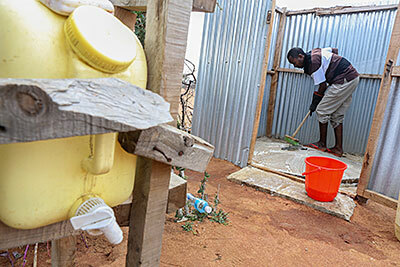 He might wash and lay out cooking utensils in the recommended way or disinfect a jerry can for water collection. Witnessing Ahmed's kindness, people are slowly opening up to what he has to teach. Initially, most of the Kambioos residents were skeptical about the impact hand-washing and sanitation would have on their lives, but, over the past few months, they've warmed up to the idea. When skeptics say it's absurd to learn about hand-washing when everyone knows how to wash their hands, Ahmed draws on examples from his Somali culture to teach these vital lessons. He talks about big celebrations when animals are slaughtered and how celebrants wash their hands with soap after eating to remove the oil. Yet, they only rinse with water before beginning a meal. He emphasizes that soap and water are important at critical times, such as before and after meals, and after using the bathroom. "When you become a teacher, you don't expect all your children to be the same," Ahmed says. "Some will be very bright. Some will be slow and won't understand. We need to be persistent, come back a day later or bring others to explain. Over time, people come to understand. Patience has paid off. You can really see the difference." When Ahmed saw that the neighbor's daughter, Imran, was repeatedly getting sick and suffering from diarrhea, he enlisted Farhiya's help. Imran's mother didn't believe in hand-washing, and no amount of lecturing was going to convince her otherwise. Farhiya insisted the two girls wash their hands whenever they were together. Ahmed's wife, Saruro, began washing Imran's clothes, and the family presented Imran with her own hygiene kit that included a bar of soap. Over time, Imran began to follow Farhiya's example. She started washing before meals and after using the bathroom. Her health improved. Now her mother has become a champion of hand-washing. "We are like one family, and I'm like Imran's second father," says Ahmed. Five months after starting her new hygiene routine, Imran has not had any more diarrhea. "She has become part of our hand-washing club," says Ahmed.